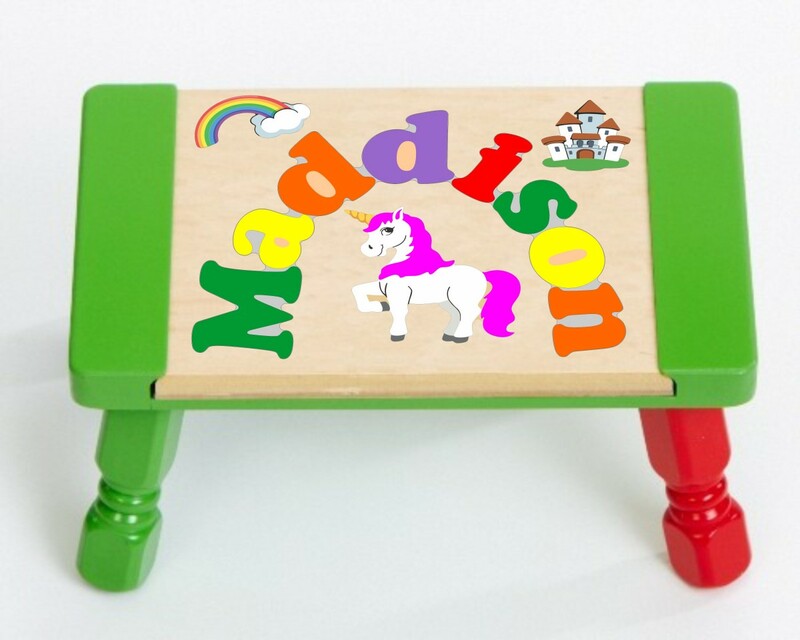 Our artistic Unicorn Puzzle Stool will certainly ride into your child's heart. 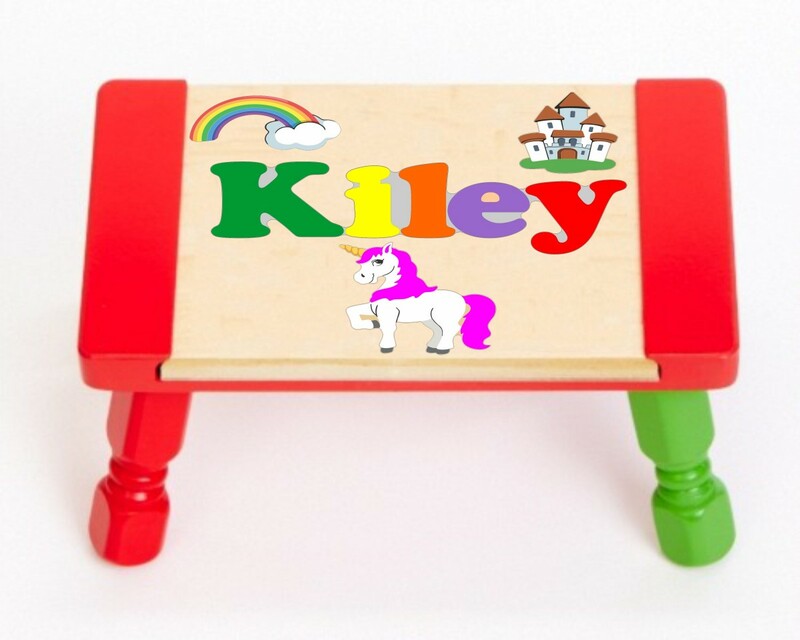 If they love unicorns, this is the puzzle stool for them! 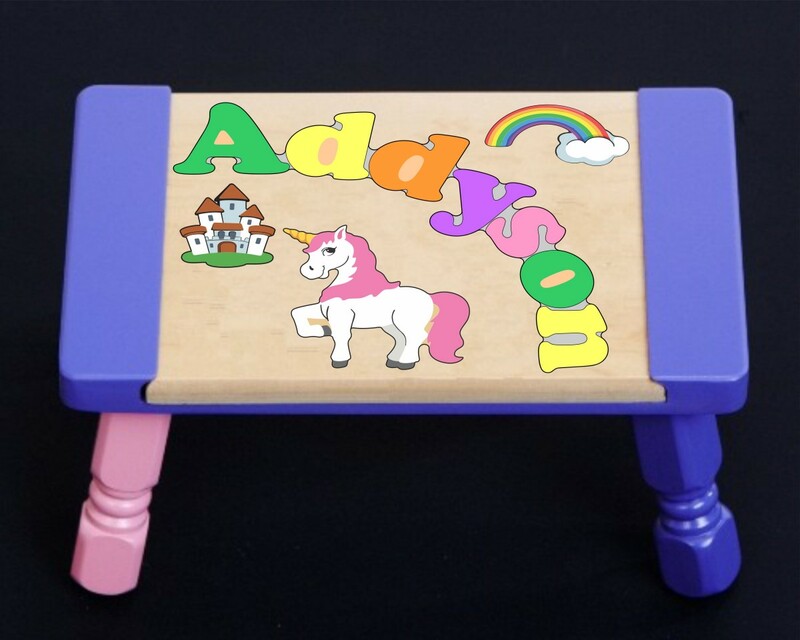 This Unicorn Puzzle Stool will not only provide hours of learning fun, but they can now reach the bathroom sink or help mom in the kitchen making their favorite cookies. 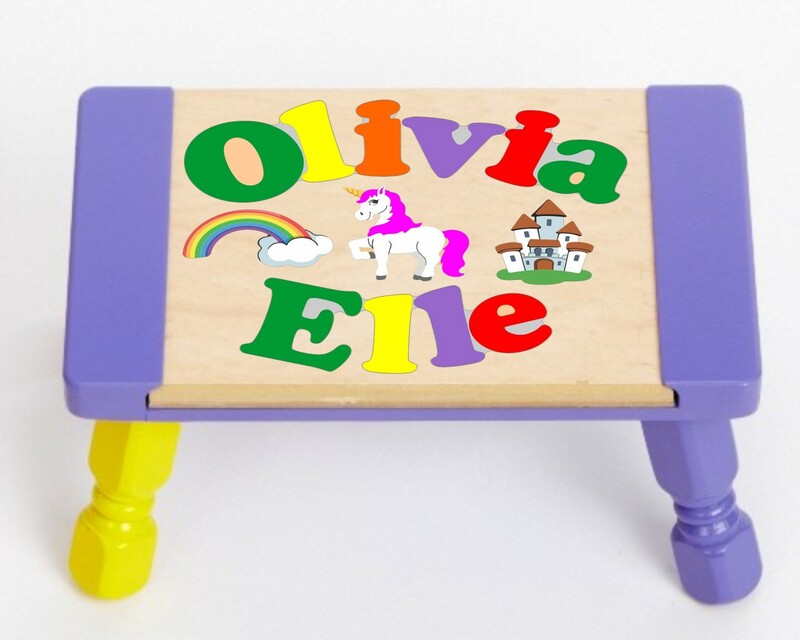 Children just love to see their name and by putting their letters together, it's a big hit. 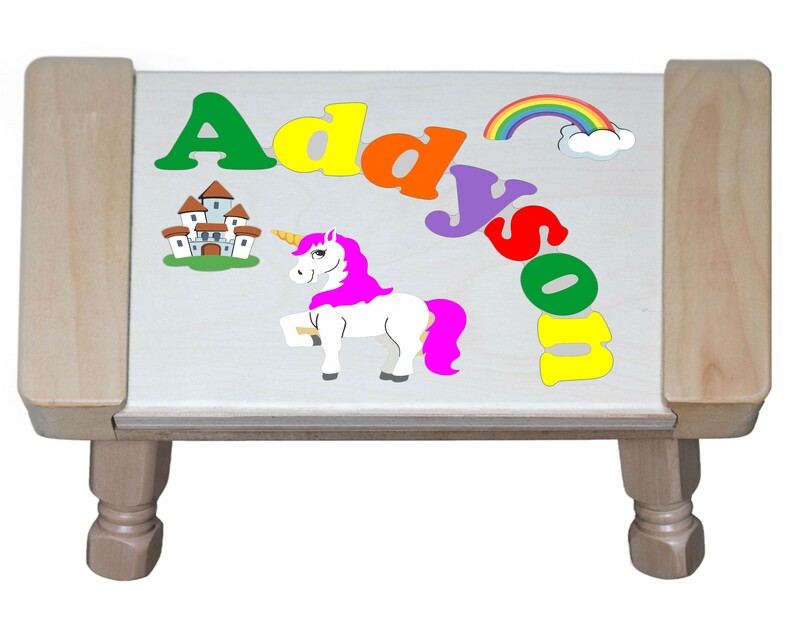 Also all of the colorful graphics (Unicorn, Rainbow and Castle) are puzzle pieces. 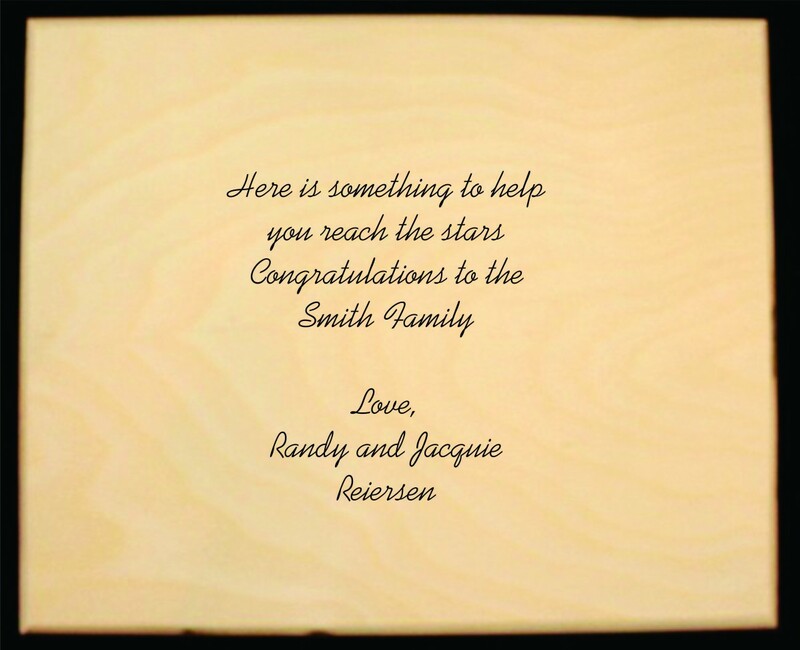 With 2 Names on one puzzle, each name can not be longer than 6 letters long. 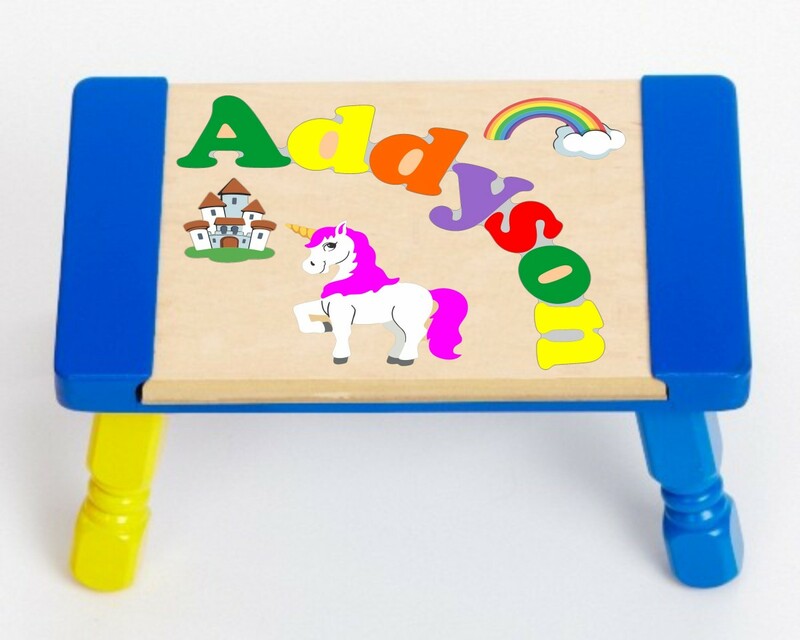 Each name will arch on the top and bottom as shown with the sample 2 name puzzle stools. 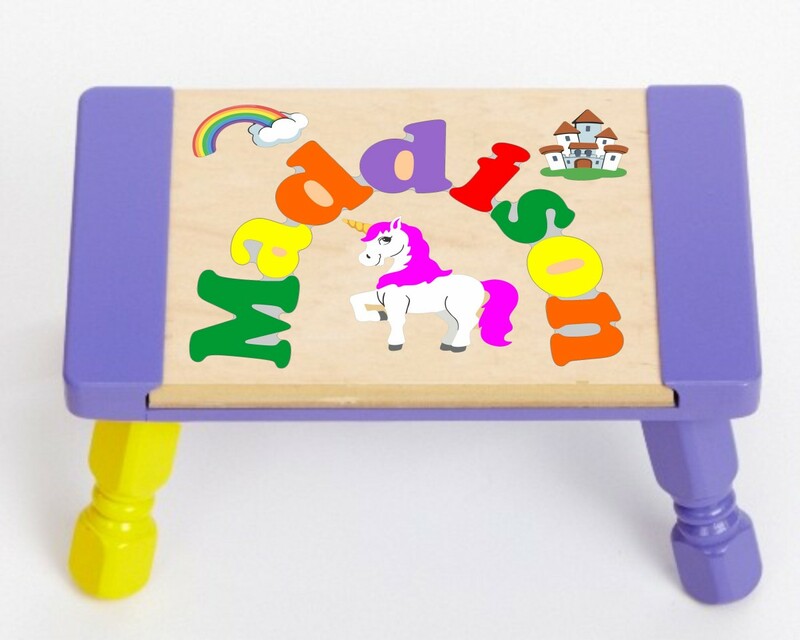 This puzzle stool measures 9" Width X 15" Length X 7" in Height with 1/2" thick wooden puzzle pieces. 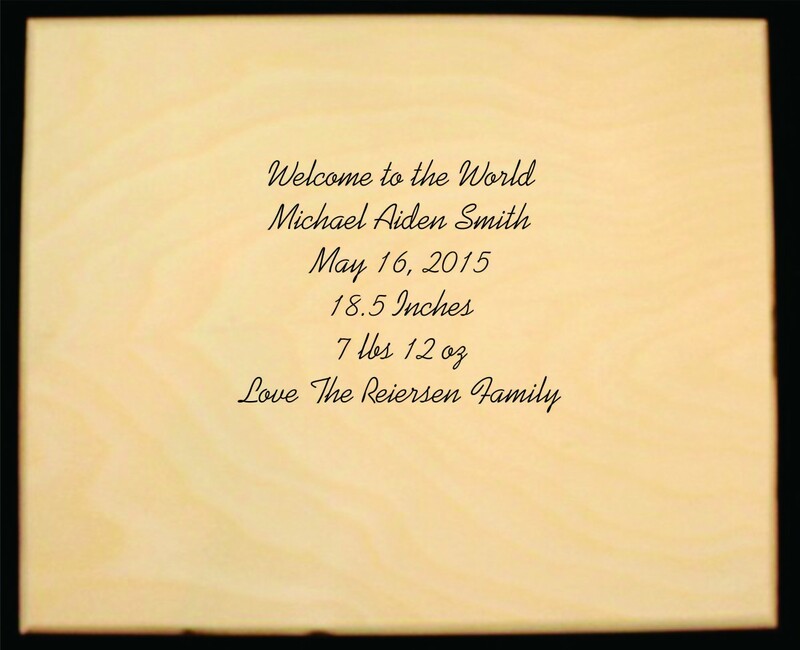 Shipping is 2 to 4 weeks. 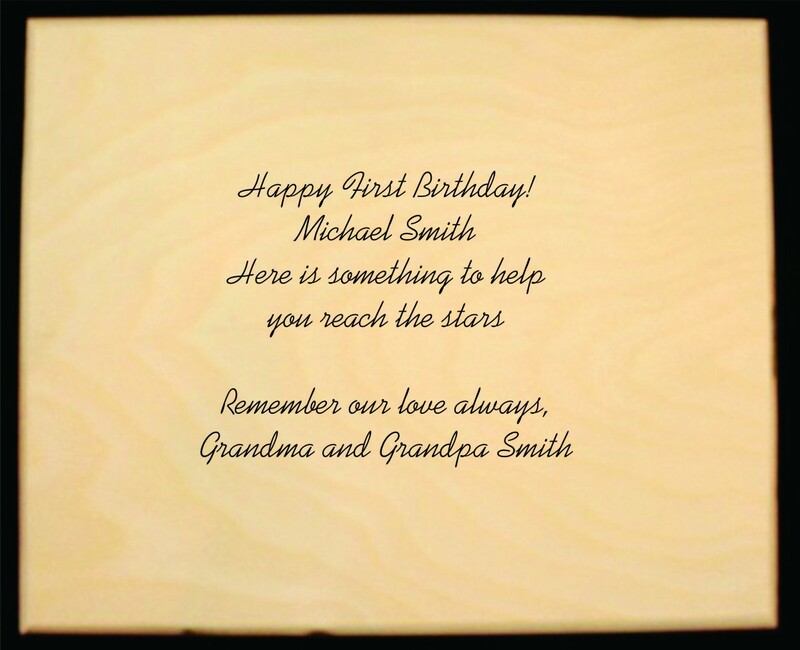 HOWEVER, if you have a SPECIFIED DATE you need your order delivered by, let us know. We will make every effort to make sure it's there on time.. 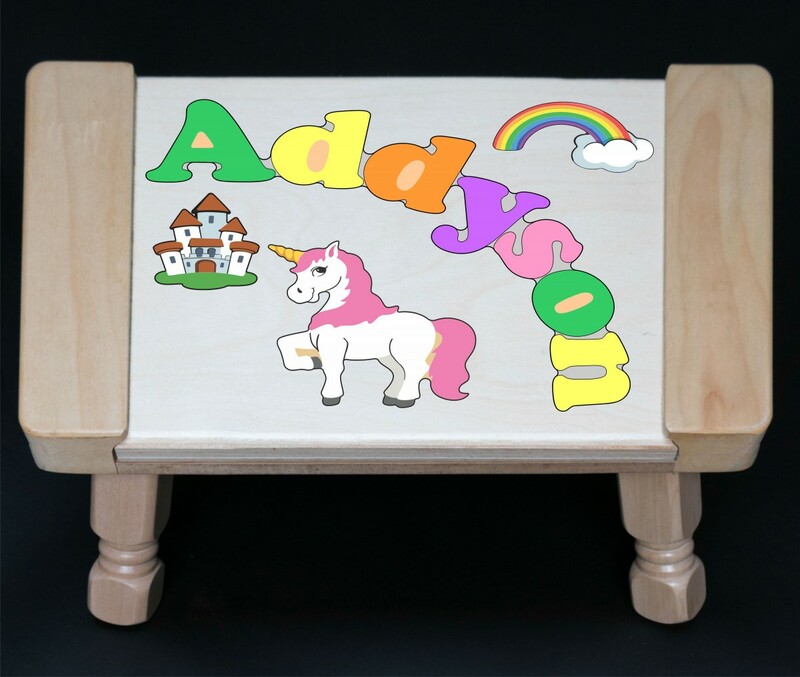 This puzzle stool will make a great Baptism Gift, Christening Gift, Birthday Gift, Newborn Gift, Baby Gift, Christmas Gift or Hanukkah Gift. 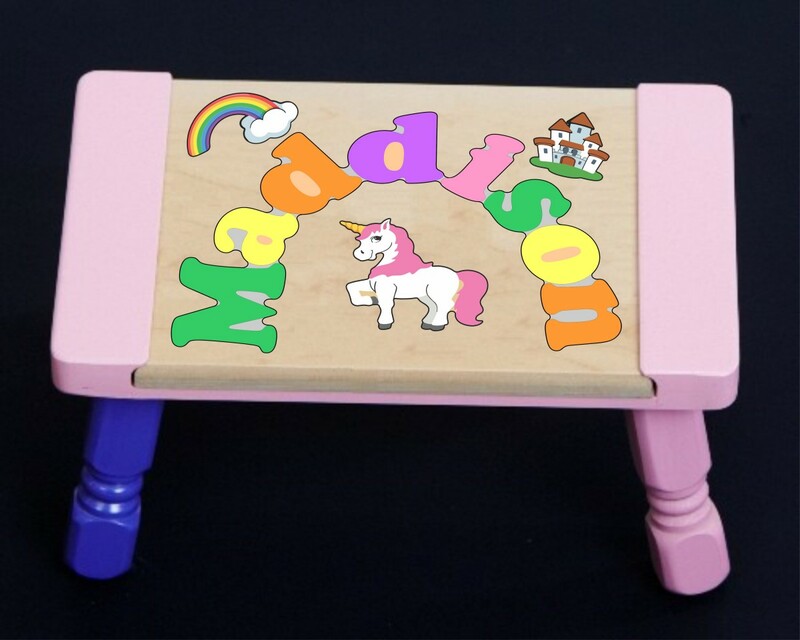 Puzzle Stool Size: 9" Width X 15" Length X 7" Height with 15 -1/2" thick wooden puzzle pieces.